Let's just get this part out of the way first: the notorious KitchenAid standing mixer could be yours for free when you enter The Kitchen Maestro Giveaway. That's a Artisan® Series 5-Quart Tilt-Head Stand Mixer to be exact. Five flamin' hot cookbooks are also thrown into this dreamy kitchen mix, from The Whole30: The 30-Day Guide to Total Health & Food Freedom to Chrissy Teigen's Cravings. The KitchenAid mixer would make for a classic addition to your countertop, it consistently receives rave reviews for its performance, and it's just an all-around right-hand man when you're whipping up your favorite recipes, whether that's bread dough or chocolate-chip cookie dough. And speaking of recipes, you'll have no shortage of them with the five cookbooks you'll win. The bunch includes everything from healthy dishes for a whole-food lifestyle to indulgent desserts. 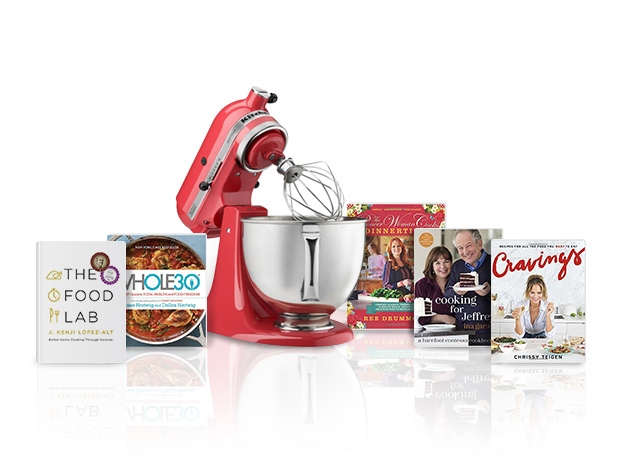 So enter The Kitchen Maestro Giveaway now--before you miss your chance!